Just the thought of a huge task list may make you feel overwhelmed, but it gives me a great sense of peace because I have all of my thoughts, ideas, and tasks outside of my head and documented in one place that I can access whenever the time is right. My task list allows me the freedom to think past today, tomorrow, and even next week. It empowers me to make proactive instead of reactive decisions about how I invest my time. My task list also enables me to live my life from a place of authority which comes from knowing I’m in control of my day. Ready to gain more control over your life? Start with conquering your task list! Throughout my work as a productivity specialist, I have observed countless times over that most people live their lives in a state of reaction. Know what I mean? Do you find yourself reacting to the emails in your inbox? The phone ringing? Colleagues walking into your office? Your own random thoughts that steer you off track in a different direction than you planned for your day? I have found that consistently using a task list enables you to take purposeful action in your day, stop feeling overwhelmed, and focus on what really matters most. Get the most out of your task list by using it in ways that boost your productivity! Always begin your tasks with an action verb. I call this verberizing your task list. Adding a verb to the beginning of each task clearly defines the action that needs to be taken, thus taking the guess work out of what step should be taken next. 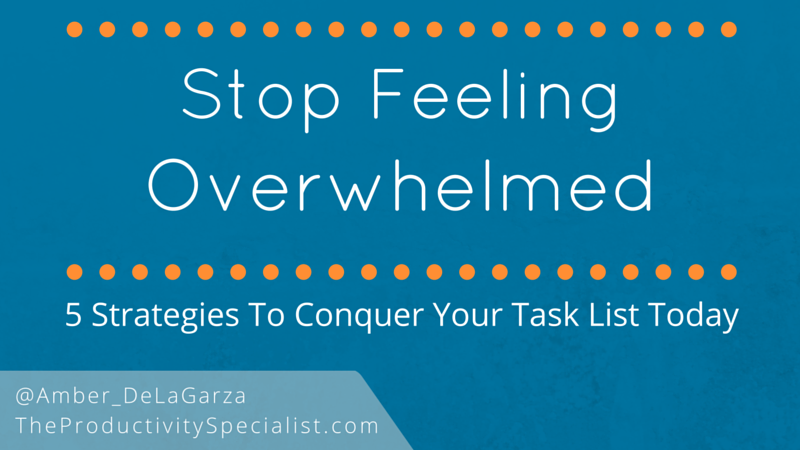 It also ensures you do not add large, generalized tasks to your list, which leads to feeling overwhelmed. 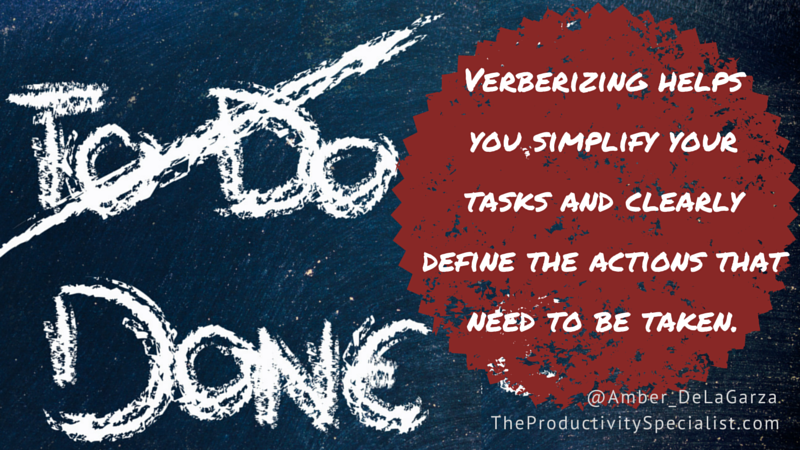 Verbs trigger action and make tasks seem less complicated. They don’t entice you to procrastinate completing them. To conquer your task list you must consistently be using your task list, both to capture your tasks and to work from. Consistency is vital to your success. You need to trust the system and work from it all the time. If you only use it some days but not others, or for some tasks but not for others, you will fail to reap your task list’s numerous benefits. Continuing to keep some tasks in your head and some on random pieces of paper doesn’t work! If you lack consistency, the feelings of anxiety and being overwhelmed will only continue and hold you back from working productively from your task list. Do you have tasks on sticky notes, crowding your inbox, dancing in your head, and jotted on steno pads? Most likely the answer is YES! Centralize your tasks in one location to make them more manageable. This enables you to never lose a task again. You’ll be less likely to forget one too, as every task will be clearly visible in one location. If your task list is scattered haphazardly across many mediums, you will default to keeping all of your tasks in your head which would likely fail every time you try it. A central location for all of your tasks means you will be able to review and proactively conquer them on a daily and weekly basis. If you choose not to keep all of your tasks in one central location, you will be forced to react to your most urgent tasks and get stuck in the fire fighter method of task completion. Centralizing your task list is the most efficient way to move through your to-dos with focus and purposeful action. Utilizing a digital task list enables you to most effectively and efficiently manage it. For many of you, going digital is an easy decision but you may still have questions as to which features your task management program/app should have. This article tackles those questions. Others of you may be uncertain about going digital and I understand your hesitation. To ease the transition, I tell my clients it is most important to consistently use a centralized task list first. Once that becomes an easy habit, I then encourage them to upgrade to a digital task list. This article explains the many great benefits of ditching paper and going digital with your task list. Warning: After reading it, you may want to take the leap! I do not mean let your task list go literally. I mean let go of the idea that you are going to get every single one of your tasks done. I understand this is much simpler said than done. After all, you are go-getting, seize-the-day, reach-for-the-sky kinds of people! Otherwise you wouldn’t be reading this article to improve your productivity. But the truth is, you will never get everything on your task list done. Why? Because there will always be new tasks to add to your list. It’s just the way it is. I know firsthand that thinking you are going to get it all done is counterproductive. When you are not able to accomplish everything you set out to do, you open the door for anxiety and the feeling of being overwhelmed to creep in. That is why it is so important to prioritize and tackle the tasks that move you toward your goals and vision of success first! Anything else you are able to complete then is just icing on the cup cake. Utilize a task list using these five strategies and it can be a valuable productivity tool. Fail to and you’re setting yourself up for a never-ending ride on the carrousel of task management stress. Tame your to-dos today by creating and maintaining a task list that you can use to your advantage and significantly benefit from. 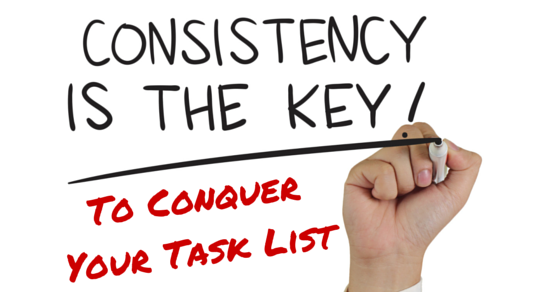 Commit to consistently working from one centralized task list.